Midnyte Reader: These Broken Stars. Title/Author: These Broken Stary by Amie Kaufman, Meagan Spooner. Narrators: Cynthia Holloway, Jonathan McClain, Sarge Anton. Synopsis: It's a night like any other on board the Icarus. Then, catastrophe strikes: the massive luxury spaceliner is yanked out of hyperspace and plummets into the nearest planet. Lilac LaRoux and Tarver Merendsen survive. And they seem to be alone. Lilac is the daughter of the richest man in the universe. Tarver comes from nothing, a young war hero who learned long ago that girls like Lilac are more trouble than they're worth. But with only each other to rely on, Lilac and Tarver must work together, making a tortuous journey across the eerie, deserted terrain to seek help. ~Goodreads.com. Midnyte Musings: These Broken Stars is a solid story that includes adventure, romance, and Sci-Fi. It's a simple tale, in a way, two people survive a spaceship crash and try to survive and get rescued. However, their differing personalities, social classes and mis-judgements about each other make this more difficult than it has to be. Tarver is a soldier and Lilac is an upper class heiress. They work through their issues and their own prejudices and beliefs and learn to work together and trust each other. Through their trials and tribulations they develop admiration for each other and romantic feelings. Actually, on their first meeting on the spaceship there was an attraction, but they both realized that their different stations in life would make anything, even a friendship, impossible. I liked how their backstories were sprinkled throughout the book. As they got to know each other, I got to know them as well. Their families, dreams and even lost relationships. It felt natural and helped the character development. The strange elements that happen on the planet they've crashed on have an eerie supernatural feel, which I enjoyed and the surprises get creepier. I have to admit there were several plot points that I did not see coming that astonished me. I don't mean to be overly dramatic, but I was quite surprised by certain events. I love when that happens when I read a book. Although it uses a familiar trope, female, upper class damsel and wrong side of the tracks, male soldier stranded together and fall in love, it could have definitely gone wrong and become cliche and predictable. However, there are a lot of surprises in this story that kept it fresh. The novel is told in first person through Lilac and Tarver and in between, are sections of Tarver being interrogated. I think it flowed well. The only issue I had is that Tarver seems older to me than 18. Not just because of the narrator, but I had a hard time reconciling all he had done not picturing Gen. and all his experience and not picture him as at least in his 20s. Also, I wasn't quite sure what happened toward the end, but I got the overall picture, and I just went along with it. 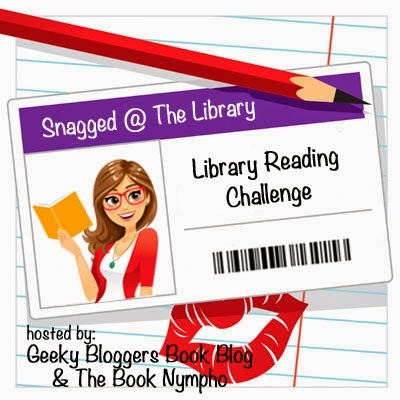 Narration: I liked the narration a lot. The only complaint was I thought Tarver sounded older than he was supposed to be. I also really loved the sci-fi feeling sound effects in between the pages of the story when he is being de-briefed. It made for a lot of interest and lent itself well to the genre. 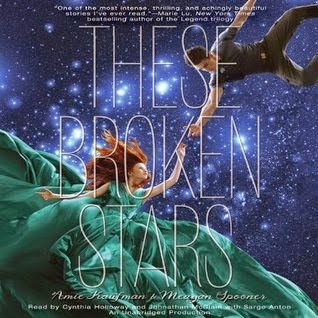 These Broken Stars was an easy book to listen to and very enjoyable. I definitely want to listen to the next book in the series. Fit Readers - Check in: January 24, 2015. Feature & Follow - Doubles of Books? (1/15/2015). 31 Days of Better Blogging.